Hochiki Conventional Sounder Base - Ivory CaseThe CSB-E is platform type sounder, which will accept ..
Hochiki Conventional Sounder Base - White caseThe CSB-E(WHT) is platform type sounder, which will ac..
Hochiki Conventional Sounder Beacon Base - Ivory case (non EN54-23 compliant)The CSBB-E is platform ..
Hochiki Conventional Sounder Beacon Base - White case (non EN54-23 compliant)The CSBB-E(WHT) is plat..
Banshee Conventional Wall SounderThe BANSHEE EXCEL is an electronic conventional sounder for interna..
Hochiki Conventional Wall Sounder Beacon - Red case (non EN54-23 compliant)The CWSB-E is a conventio.. Conventional Weatherproof Wall SounderThe BANSHEE EXCEL IP66 is an electronic conventional sounder f.. 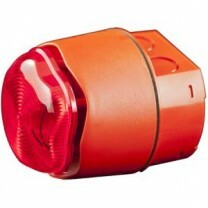 Conventional Weatherproof Wall Sounder/StrobeThe BANSHEE EXCEL LITE IP66 combines the modern aesthet..